It's like looking through a window. When you are looking at something through a window do you notice the curtains or the color of the wall or the carpet? Most likely the answer is NO! You are looking at the scene outside the window and everything else goes away. They are distractions but you don't notice them. That is the beauty of putting a mat or mount or frame around a painting that is almost finished. The mat or frame removes the distractions around the painting. The mat/frame becomes a window and now you can clearly see the painting and evaluate it more easily. Your support board color and all the marks on this board can no longer influence how you see your painting. When you haven't isolated your paintings from these distractions they actually become a part of the painting! Now you can clearly see the painting and look at the important considerations of your design, values and color. You can see how the edges of your painting work with the frame. Are there awkward shapes? Is there any hard edges leading the eye off the painting? How does the viewer travel through the painting? The window onto the painting helps you answer these questions. 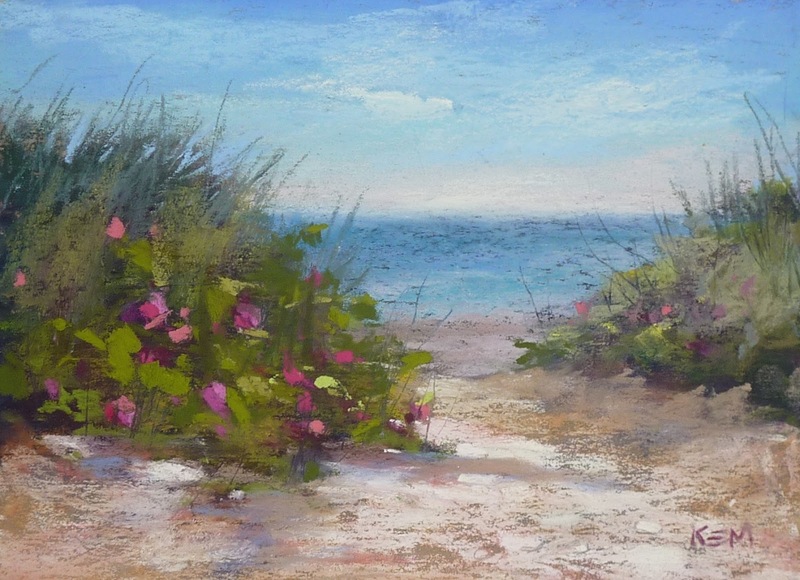 What if I don't want to carry mats or frames when I travel, paint en plein air or go to class? Try this great tip I learned from Richard McKinley. 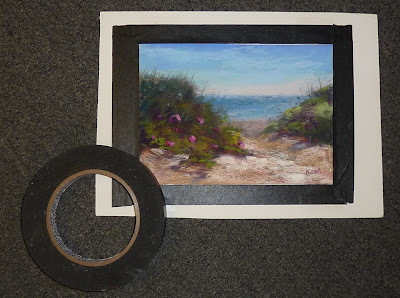 When I took workshops with Richard he would often use black artist tape to create frames around finished or almost finished paintings. The artist tape is easy to remove and of course easy to throw in with your painting supplies. Get your black artist tape on Amazon or other online art stores. This is a great idea. It'll also keep the edges of your painting crisp, plus, ensure that you leave a matting edge on the paper. It's so easy to work right to the edges on a small piece - only to find that clipping 1/4" off all the sides changes the composition. I grew very frustrated with this years ago and when I didn't have mats handy for it, started drafting a mat edge into the paper before starting. Mark off the picture area and leave some space around it. Unless the paper is very small I like to leave enough space between a standard size painting and the edge that I can make test marks. When I used black artist tape for it, the results were beautiful and very easy to respond to composition changes. Today's art is gorgeous. I love that rose bush and the distant sea. Wonderful sense of place.